Roosevelt’s 1944 State of the Union message to Congress shows the U.S. the way forward. 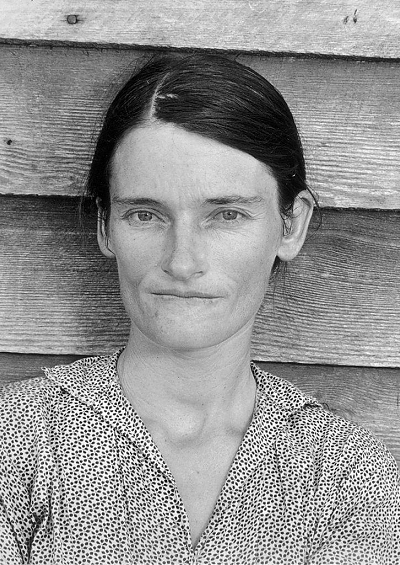 Walker Evans's portrait of Allie Mae Burroughs during the Great Depression. Seventy years ago, Franklin D. Roosevelt proposed a new bill of rights. An Economic Bill of Rights. FDR believed that until there was economic security at home, there could not be peace in the world. This nation in the past two years has become an active partner in the world’s greatest war against human slavery. It is our duty now to begin to lay the plans and determine the strategy for the winning of a lasting peace and the establishment of an American standard of living higher than ever before known. We cannot be content, no matter how high the general standard of living may be, if some fraction of our people — whether it be one-third or one-fifth or one-tenth — is ill-fed, ill-clothed, ill-housed and insecure. This Republic had its beginning, and grew to its present strength, under the protection of certain inalienable political rights — among them the right of free speech, free press, free worship, trial by jury, freedom from unreasonable searches and seizures. They were our rights to life and liberty. As our Nation has grown in size and stature, however — as our industrial economy expanded — these political rights proved inadequate to assure us equality in the pursuit of happiness. In our day these economic truths have become accepted as self-evident. We have accepted, so to speak, a second Bill of Rights under which a new basis of security and prosperity can be established for all regardless of station, race or creed. I ask the Congress to explore the means for implementing this economic bill of rights — for it is definitely the responsibility of Congress to do so. Many of these problems are already before the committees of the Congress in the form of proposed legislation. I shall from time to time communicate with the Congress with respect to these and further proposals. In the event that no adequate program of progress is evolved, I am certain that the Nation will be conscious of the fact. Our fighting men abroad — and their families at home — expect such a program and have a right to insist upon it. It is to their demands that this Government should pay heed rather than to the whining demands of selfish pressure groups who seek to feather their nests while young Americans are dying. Each and every one of us has a solemn obligation under God to serve this Nation in its most critical hour — to keep this Nation great — to make this Nation greater in a better world. Editor’s note: This text was adapted from Franklin D. Roosevelt’s State of the Union message to the U.S. Congress on January 11, 1944. The full text can be found here.